"We must acknowledge once and for all that the purpose of diplomacy... is to prolong a crisis." The Enterprise pays a call to another of the Federation's insane asylums and encounters a recent inmate, Starfleet Captain Garth of Izar (Steve Ihnat), who has the ability to alter his body's form to imitate other beings. Garth has used his rare power to emulate Governor Corey (Key Luke), the supervisor of the asylum and traps Kirk and Spock behind the planetary security shield. The self-styled "Lord" Garth uses various strategies, some humorous and some evil, to force Kirk to surrender the ship so that he can wreak revenge on his enemies and dominate the galaxy. This episode has some problems in its premise, but is carried in high style by the bravura acting of Ihnat and Yvonne Craig as another inmate, Marta the insane Orion slave girl. As Garth, Ihnat's presence dominates the screen and paints a chilling and darkly humorous portrait of a talented and powerful ship's captain who has "gone to the dark side." Craig's Marta is seductive and lovely in her devotion to Garth and her predatory black widow method of insuring the fidelity of her lovers. Ihnat was one of many Star Trek guest actors who appeared on several popular television programs in the 1960s and came up through the same police dramas and westerns of the era that Gene Roddenberry made his way through on the way to creating his sci-fi classic. Craig had gained great popularity when she was cast as Batgirl in the Batman series during its final season. This is a very entertaining episode with aliens aplenty and a great deal of suspense as Garth uses some interesting methods of tricking and coercing Kirk into surrendering. Spock is oddly impotent in his ability to aid Kirk in the situation for some reason. The scenes between Kirk and Garth are marvelous as the two great hams go toe-to-toe in chewing up the scenery. Great humor—without camp—contrasting with the evil that Garth perpetrates makes for a great show all around, so I can easily give Whom Gods Destroy three full Enterprises. The Enterprise is sent to the planet Gideon, which has been in negotiations with the Federation to explore joining the galactic organization. Very secretive, the government of Gideon will only allow one representative of the Federation to visit the planet and that one person is Captain James T. Kirk. When Spock beams Kirk to what had been the coordinates of the Gideon Council Chamber, the Captain materializes to find himself still on the Enterprise, but the entire crew has disappeared. Exploring the ship he encounters Odana (Sharon Acker), seemingly a resident of Gideon but with no memory of how she got there, and together they attempt to unravel this mystery. There is much that can be said about the story here and the message involved in its unraveling but no such spoiler will be given to ruin any potential viewer's interest. Although there are some logical difficulties in the plot and this is one episode that contains almost no action, there are interesting ethical and intellectual issues that are portrayed in very unique fashion. The Kirk story also gets very spooky in the second half and contrasts nicely with Spock's diplomatic difficulties in getting cooperation from the Gideon authorities. I have had occasion to watch several episodes of Star Trek that were directed by Jud Taylor and I have been increasingly impressed with the skill that he uses to enhance the stories with interesting, stylized camera shots. One particular example from this episode is in the second chapter as Kirk is attempting to find anyone else on board with the intercom, Taylor provides a unexpected view of the captain from the front right of the bridge looking back toward the command chair. Taylor has had a long career in television directing, including such well-known series as Longstreet, Kung Fu: The Legend Continues and, recently, Law & Order: Special Victims Unit. One of the hallmarks of Star Trek: The Original Series is that it used its science fiction format to tell stories of intellectual depth, as well as exciting action pieces. The show often addresses issues that were not referred to in prime-time television at the time. This episode is potent in its illustration of some very basic difficulties of human affairs. I rate it a solid three Enterprises. Image Transfer Review: Marta is green! By this I mean that in Whom Gods Destroy, Yvonne Craig's makeup is very nicely rendered on the screen by the image transfer. Both these episodes look great and the details are wonderful with the colorful costumes in each benefitting excellently. Each also benefits from the lack of special effects shots that don't quite measure up to modern digital viewing. Audio Transfer Review: It is enjoyable to listen in Dolby Digital 5.1 to the subtle sound design on these old shows. The little beeps and boops, trills and squeaks, and blips and boinks all come through beautifully and add to the enjoyment of these shows that I have seen so many times. Extras Review: What these discs gain in the image and sound transfer, they lack in extras. We get the usual slender information booklet and the original trailers. And... well, there isn't any more. At least the series is consistent. Note to Paramount: As I have reviewed these discs and found out more about the people who acted and worked on Star Trek: The Original Series, I think it is a real mistake that a little time wasn't spent by the research department to dig up some of the facts that I have tried to present in some of my reviews that tell some of the stories of these people. 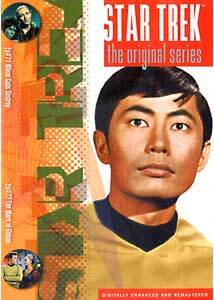 A few short biographical screens would not have added much to the cost of these discs and would have made them much more valuable for both fans of Star Trek and fans of series television. Two entertainment-filled trips for the crew of the Enterprise here and, for science fiction fans, this is a very desirable disc. There is fine writing, directing and acting and the stories, though flawed, are carried off in excellent Star Trek-style. These episodes are two lesser-known adventures that have much to recommend them.